March 19, 1913: Mary Marguerite Dill is born in Sonoma, California. 1938-40: Mary works for the FPA in Oakland on federal art projects. At the beginning of the war, she worked as a draftsman for Bill Hewlett and Dave Packard. 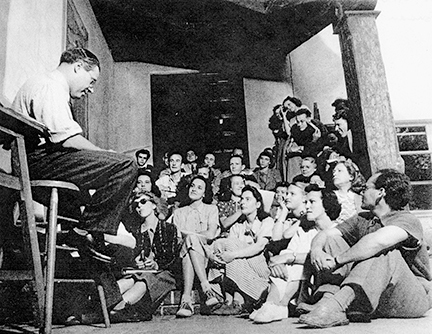 1945-6: Mary attends the Institute of Design in Chicago, under the direction of Laszlo Moholy-Nagy, earning a Master of Arts degree. Moholy-Nagy was to become the single greatest influence on her work. At the Institute, she studied the entire Bauhaus curriculum, which included such areas as photography, architecture, and design, as well as painting. 1947: The family moves to Helena, Arkansas. 1949: The family moves from Arkansas to Los Altos Hills, California, where they are joined by Mary's mother. In the following year, Mary joins Local 510 of the Sign, Scene and Pictorial Painters Union, in hopes of finding free-lance work as a commercial artist. 1952: Mary wins first prize in the “McCall's Kitchen Contest.” Contestants were required to redesign their own kitchens, submitting highly detailed plans. The two first prize-winners had their kitchens remodeled, down to the dishes, glasses, and silverware they had specified; their kitchens were featured in the July 1952 issue of McCall's magazine, with numerous “Before” and “After” photos. 1955 – 1962: Mary works on numerous free-lance assignments, including billboards, murals, and mosaics. On her own time, she begins doing small works in tempera, crosshatched in black ink. 1964: Mary and Wilbur are divorced, and Mary moves to Mendocino. For the first time, she has the space and leisure to paint large canvases. 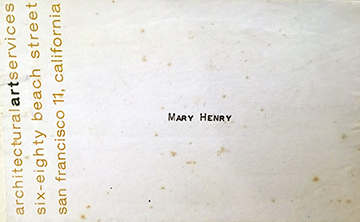 1964-75 Living in Mendocino, Mary has few opportunities to exhibit and little income, but unlimited freedom to paint. She turns her house into the Sea Change Inn. Eventually, she sells the big house for $150,000. She enjoyed Mendocino's hippie phase, but as the town grew increasingly commercialized, she became ready to move on. 1974: She travels to Alaska, staying for some time with a friend's daughter in Wiseman on the North Slope and filling a notebook with sketches — the genesis of her North Slope series of paintings. 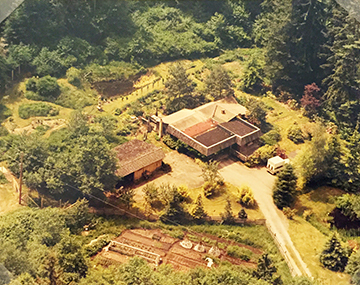 1982: Mary sells her Everett houses and buys an old farmhouse near Freeland on Whidbey Island, Washington. The Whidbey house is set on six acres of land, and Mary begins to transform it into a landscaped English-style garden. She falls into a routine of gardening during the spring and summer and painting when the weather turned rainy. 2009: Mary suffers a fatal stroke and dies several days later in Coupeville on Whidbey Island.